Contributors. Preface. Impact of Soil Erosion on Crop Yields in North America, C. den Biggelaar, R. Lal, K. Wiebe, and V. Breneman. Bioremediation of Petroleum Hydrocarbons in Soil, J.P. Salanitro. Genetics of Flowering Time in Chickpea and Its Bearing on Productivity in Semiarid Environments, J. Kumar and S. Abbo. Environment-Sensitive Genic Male Sterility (EGMS) in Crops, S.S. Virmani and M. Ilyas-Ahmed. Index. Volume 72 contains four outstanding reviews detailing advances in the plant and environmental soil sciences. Chapter 1 deals with a timely and significant topic in North America and indeed in the world. This review provides background information, data sources and analyses, and implications for research and policy. Chapter 2 is a treatise on cutting-edge developments in bioremediation of petroleum-contaminated soils. Chapter 3 deals with the genetics of flowering time in the chickpea and its effect on productivity in semi-arid environments. 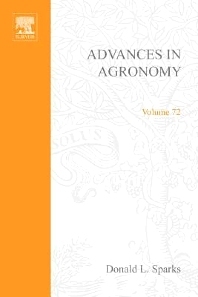 Chapter 4 covers environment-sensitive genetic male sterility (EGMS) in crops. Professionals and students in the field of agronomy and plant, soil, and environmental sciences.